The midsummer championships are fast approaching and our membership has arrived just in time, hooray! We’re officially TREC Ireland members, Teddy and I optedd to join our local(ish) team West Cork TREC. We are loving rocking the pink and blue! Teddy and I have never competed a 3 phase event before, we hadn’t seen one either so we had no idea what to expect. Training wise we had been working on the S-Bend both ridden and in-hand, the reinback and immobility in the past few months so we continued this. This new 3 phase would include a PTV (obstacles) POR (hacking with map and timer) and MA (control of paces). We added more hacking practice to our routine to gain extra confidence being on new roads, meeting dogs, people and cyclists. Teddy was a really terrible napper only a year ago, it could take 30mins just to get a few steps out of the yard and we have worked incredibly hard to build up his confidence in this area. I do think when people meet Teddy now they don’t realise how much work it has taken to get him to where he is and we still have a way to go but I’m astounded at how far this pony has come in the less than 12 months I have restarted him. The POR would be our biggest challenge, or so I thought… The MA wasn’t too much of a concern for me as I’ve had to spend so much time getting Teddy to a slow relaxed walk that I didn’t want to counter-act that too much at this point in his training. We are also still working on the balance in canter so I wasn’t sure that slowing down would be possible but we would give it a shot. Kitted out with our equiptment list, camping gear and plenty of feed we set off on the 3hr journey to Knocknaraha in Cork to the Midsummer Championships. On arrival we found the camp site and set up our corale, with help from a new neighbour (and TREC pair) the tent also went up and as soon as Teddy was sorted I put the kettle on. There would be lots to do in the morning and it was near enough 10pm by the time we were set up and I’d not even thought about dinner. The day was beautifully sunny but very hot and I was a bit concerned with the ground being so hard and Teddy barefoot that we would struggle. We went up for our vetting and equiptment check which all went to plan, with our maps written down and plans in place, Lucy (my TREC pair) and I set off. The route was a perfect mix of challenging and scenic. The directions were pretty straight forward however towards the end of the hack we took a wrong turn and ended up getting home quite a bit later. In summary, Teddy did find the hack difficult, it was much longer than what we were able to practice at home, being surrounded by lots of very busy roads (especially busy in tourism season). In hindsight I would have picked level 1 to start us off. I didn’t know about timing on the route and I think training is definately on the cards next time it’s on. 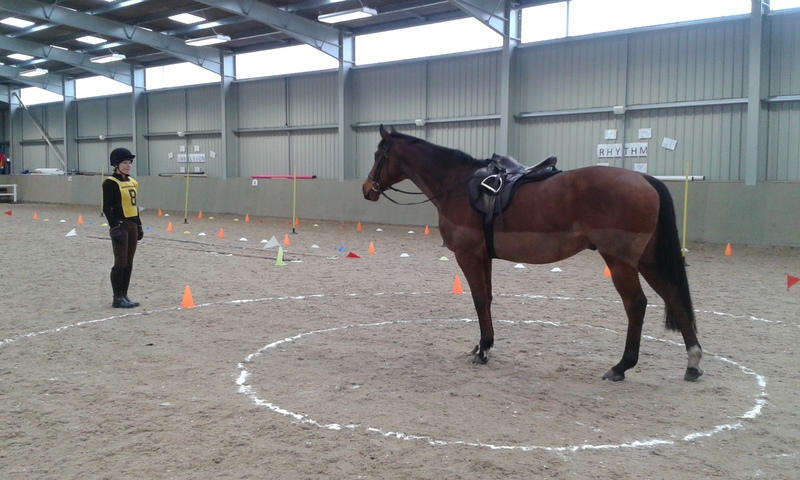 I was very proud of Teddy for leading at points when he needed to reassure the other horse. Our slow paced walk held us back a little but it was difficult to push too hard with the heat and the hard ground. We did get to enjoy a lovely canter in green fields at the last leg. The ponies did really well for us and we never had any behavioural problems. Teddy and I finishing the POR, poor Ted was exhausted! A big feed was given that night and a cool down. What can I say about the MA, apart from a learning curve! We went to warm up which I didn’t do much of as his feet were a little tender and he was a bit stiff from the day before so I just checked in on some transitions and he seemed rather relaxed. However when it was our turn to go in the corridoor there were a few things we hadn’t banked on… people sat on chairs dotted along the route, white chalk on the ground and white and red flag posts. I think if it had been only 1 or possibly 2 we would have coped better but Teddy went in to total meltdown and somewhere between learning and freeze I could feel flight responses trembling under the saddle. I did my best to calm him down and we completed the walk phase albeit with a step of jog so we scored zero. However, we learned so much we will have plenty to practice from this. The PTV course was incredible. I must mention here a massive well done to Frances Whooley and anyone who collaborated and set up the course, it was so well planned and there were lots that were new for us. The PTV went much better for us, I’m not sure on our score as individual scores haven’t been released yet but I was really pleased with what we aimed for. I was particularly proud of Teddy with in-hand immobility (example below) and our s-bends. We came stuck at the gate and some usually good obstacles however I think the newness of everything and this being Teddy’s first outdoor PTV really had him on edge and I could feel at times he was nowhere near as relaxed as at the arena based PTVs. Lucy and I came 2nd in Level 2 Pairs, we received some lovely prizes and a blue rossette, most importantly though we made lots of memories and our ponies did us proud. Teddy and I are already practicing for the next Championships to be held at The Field Equestrian Centre on July 22nd. If you see us there please come say Howdy!